Scampering away with a purloined carrot or a radish, this adorable bunny is as cute as thieves come! 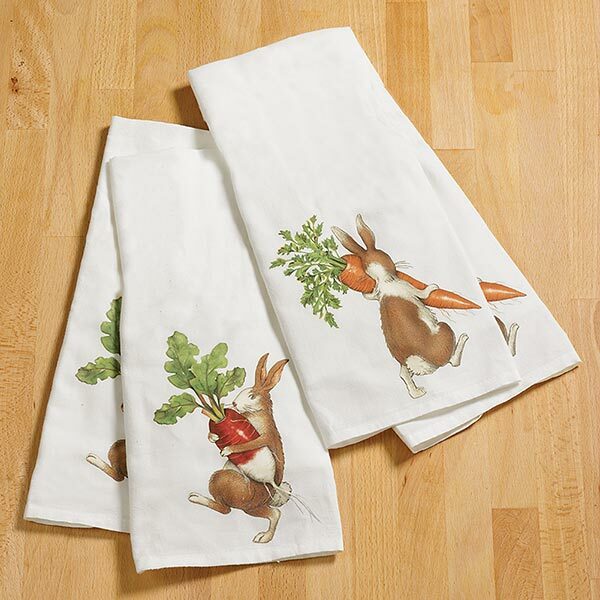 Measuring approximately 27"x30", each 100% cotton towel folds to feature one of the irresistibly cute images (we're selling sets of two carrot or two radish towels). And to sweeten the pot, we're also offering one of the Carrot Thief towels wrapped up in a pretty package with a bag of carrot cake mix (a few extra ingredients like eggs and frosting not included). What a delightful gift...for Easter or anytime! Towels are machine washable.